"A cookbook is only as good as its poorest recipe." American Masters Online sat down with Julia! America’s Favorite Chef filmmaker Marilyn Mellowes. American Masters: What got you interested in this project? 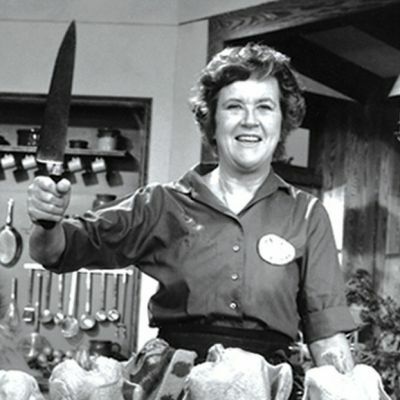 What drew you to Julia Child? Marilyn Mellowes: Julia was a larger-than-life figure who revolutionized the way that Americans ate, talked, and thought about food. She was warm, completely unpretentious and embraced life with an ease and humor that I found infectious and irresistible. At the same time, she was a person of integrity, who set high standards for herself and for others. Behind the sometimes goofy exterior was a fine mind focused tightly on what she wanted to achieve. AM: Did you learn anything that surprised you about Julia while making this film? MM: Yes, absolutely! I was very surprised to discover that Julia did not discover her interest in cooking until she was well into her thirties, and that she did not appear on television until she was over fifty. In our culture, which is so obsessed with beauty and youth, we often we tend to assume that talent makes itself manifest in youth – but Julia proves that that is not necessarily so. She found herself relatively late in life. Really, she is a classic example of a late bloomer. Also, she never dropped a chicken on the floor – as so many people think. We asked her, we asked her producer, we asked her friends – no chicken. Plus, I personally screened every chicken show that appeared on TFC, and she never dropped it. But there are people who swear – I mean, swear! – that they saw her do this. So its interesting to speculate how this myth grew to such proportions. AM: Are there any interesting anecdotes about the filming or interviewees? MM: Meeting Julia. After living in Cambridge for more than thirty years, I had seen Julia around town, usually at the market. But our interview with her was the first time that I had actually encountered her face to face. She was an imposing and impressive figure. Quite stooped, but still a huge presence. Although she has been interviewed countless times, she was completely engaged in the process and genuinely curious about our crew. At one point, we stopped to change tapes, and Julia took a big spoonful of honey from a jar to soothe her throat. A little ended up on her chin – she just wiped it away and got on with the next question. AM: Could you describe the production process, anything about how you chose to shoot the film? MM: The shape and direction of the film turned on the fact that I had access to Julia’s archives, which are housed here at the Schlesinger Library at Radcliffe and to family photos, including the archive of her late husband Paul, who was a talented amateur photographer. Julia herself gave access to this collection. I will never forget the day that it arrived in my office – dozens and dozens and dozens of boxes of negatives and prints. All very meticulously catalogued by Paul in stenographer notebooks dating back to the late forties. He recorded everything – the lens, exposure, quality of the image, date, etc. Nothing was left out. At some point, someone went to the trouble of transcribing all this information into a computer, and printing it out into a huge notebook. This proved to be a goldmine. I was able to find pictures to fill places in the film where we had no images – wonderful pictures of Julia in Paris, of Paul in the OSS, Julia in her kitchen. In addition, I was able to access the private picture collections in the possession of various nieces and nephews, as well as a box of albums loaned by her sister. Some of these images were nearly 100 years old, and the albums were literally crumbling in my hands. Here were pictures of her parents, Julia as a very young girl – already showing a zest for life – the cottage her father had built by the sea, Julia on family outings and posing with the family dogs. All very charming. In the end, we used over a hundred images and personal letters, which I hope gave the film a warm and intimate quality, and allowed the viewer a glimpse into Julia’s life rarely seen by the public. AM: What do you want viewers to take away from the film? MM: Two things. First, I do think that Julia sets a wonderful example of a life well lived. She was a high spirited and deeply generous woman, who lived life to the fullest and did not spend time wallowing in regret or moping about the past. She was always looking forward. And second, I hope that people will learn that her talent did not come easily to her. She worked hard and persisted through some rough times. Mastering the Art of French Cooking, which became a culinary classic and sold over a million copies, was repeatedly rejected by publishers, until it was rescued by the Knopf publishing house, and particularly by Judith Jones, who had the incredible foresight to recognize what a remarkable masterpiece the book would one day become. Major funding for Julia! America’s Favorite Chef is provided by Feast it Forward.